The debate over arming teachers has increased in intensity in the wake of the February 14th Marjory Stoneman Douglas High School shooting that took the lives of 17 students and teachers. President Trump stated that arming teachers would be a big deterrent to future attacks, but few educators agree. Teachers and administrators in Pennsylvania are weighing in on school safety and agree that it is time to add their voices to the national debate. Many say the events in Florida feel like a “tipping point” in efforts to prevent school violence. Organizations representing school boards, teachers, principals and administrators are among the professionals who publicly oppose arming teachers in the classroom. So what can be done to stop school shootings and make students safer? In Pennsylvania, those organizations are meeting and collaborating their efforts to find solutions to potential dangers in schools. Wednesday’s Smart Talk brings four of them together. Joining us to talk about school safety are John Callahan, Chief Advocacy Officer with the Pennsylvania School Boards Association, Mark D. DiRocco, Executive Director, Pennsylvania Association of School Administrators, Paul M. Healey is Executive Director of the Pennsylvania Principals Association, and Dolores McCracken, President of the Pennsylvania State Education Association, the state’s largest teachers’ union. In a matter of a just a few weeks, the lawsuit filed by the Pennsylvania League of Women Voters charging that the state’s Congressional districts were gerrymandered by Republicans has turned into an all-out political showdown that involves the legislature, the governor, state and federal courts and now the U.S. Supreme Court. Republicans cried foul saying the court was partisan in favor of Democrats and a few even discussed impeaching justices because the court overstpped its authority by taking the redistricting process out of lawmakers’ hands. It’s not the first time legislators have accused judges of deciding cases based on politics rather than the law, but it may be the loudest the case has ever been made. The non-partisan group Pennsylvanians for Modern Courts has long advocated for change. The group’s President and CEO Maida Milone is on Tuesday’s Smart Talk to explain why. High school students across the country have been demanding stricter laws on guns after the shooting at a school in Parkland, Florida left 17 dead on February 14. Since the attack, students across southern Flordia, Washington D.C. and other areas throughout the country have begun walking out of their classrooms as a form of protest. These massive protests seem to be just the beginning of the newly named “#NeverAgain” movement. The student walk outs emulate similar demonstrations throughout U.S. history. During the mid-20th century, students used walk outs to protest civil rights issues, the Vietnam war and for better learning conditions. This tactic proved to be effective, as it forced Congress to act in order to have students return to the classroom. However, because it’s been so long since having comparable protests, many wonder whether or not the protests will be as effective in inciting action. Jonathan Zimmerman, education historian from the University of Pennsylvania, appears on Monday’s Smart Talk to discuss the effectiveness of wide scale protests. White nationalist groups like the Ku Klux Klan and National Socialist Movement often used to be perceived as not much more than part of a disorganized counter culture. However, membership in these organizations has been rising. Racially motivated violence seems to be more and more frequent too. In the past few years, Vegas Tenold, an award-winning journalist and author, has spent time internally researching these groups and has written a book about his experience titled Everything You Love Will Burn. Tenold joins us on Monday’s Smart Talk discuss his in depth experiences of the dark underbelly of America. Vegas Tenold will appear at Midtown Scholar Bookstore in Harrisburg Tuesday at 7 p.m. According to NPR’s reporting, the number of threats of violence against schools across the country has increased since last week’s school shooting in Parkland, Florida. Threats have been made against schools throughout Pennsylvania, including several in the midstate. Schools in the Central York District in York County were closed most of this week after threats were made. Harrisburg schools are closed Friday after a threat. Rumors of threats spread in adjoining and other schools too. Arrests have been made in a few of the cases. Many worried parents have decided not to send their kids to school. Are these threats the work of copycats or are educators, parents and police more focused on the threats since the Florida shooting? WITF’s Brett Sholtis has reported on the threats made to schools this week and joins us on Friday’s Smart Talk. Also, on a much happier note, the Central Pennsylvania Spelling Bee is set for this weekend at WITF’s Public Media Center. On Friday’s Smart Talk, Host Scott LaMar, Witf’s Capitol Bureau Chief Katie Meyer, All things Considered host Rachel McDevitt and audio engineer and WITF Music producer Joe Ulrich take a shot at spelling and show just how smart the young spellers are. Republican legislative leaders have requested a stay from the U.S. Supreme Court, saying the Pennsylvania Supreme Court overstepped its authority when it adopted its own map for the state’s Congressional district boundaries earlier this week. Read more about it here. Republicans claim the Pennsylvania Supreme Court usurped a Constitutional responsibility of the legislature when it created its own map. The new congressional map overhauls a Republican-drawn map in 2011 widely viewed as among the nation’s most gerrymandered. Republicans argue the new map now tips the scale in favor of Democrats and has created “chaos and confusion” ahead of the May 15 primary election. Other organizations are also speaking out about the new map. Minority advocacy groups are concerned the new plan may dilute votes from black communities. WITF’s Capitol Bureau Chief Katie Meyer and WITF Keystone Crossroads reporter Emily Previti appear on Thursdays Smart Talk to break down this issue and discuss the GOP legal challenge. We also hear from Micah Sims, Executive Director of the good government group Common Cause Pennsylvania. When the history of public broadcasting is written, one of the icons will be Fred Rogers of Mr. Rogers’ Neighborhood — the children’s TV show that premiered on February 19, 1968 — 50 years ago this week. Wednesday’s Smart Talk is a special one as we make a Road Trip to the Senator John Heinz History Center in Pittsburgh. 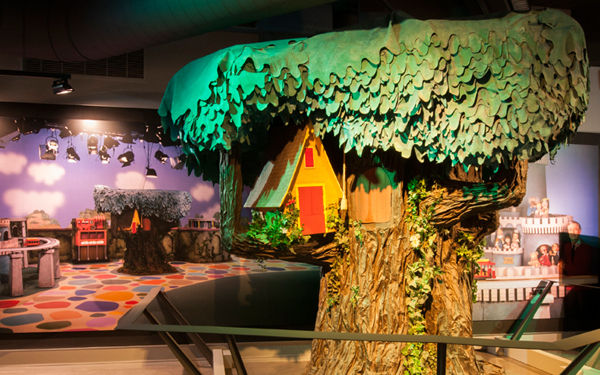 We discuss Fred Rogers’ legacy with several people who knew and worked with him, the history of the TV show and describe an exhibit at the History Center that includes Mr. Rogers’ living room and the Great Oak Tree, where Henrietta Pussycat and X the Owl lived. Mr. Rogers’ Neighborhood was a different kind of TV show for children and it was made that way by Fred Rogers. Fred Rogers was a soft-spoken and gentle man who didn’t speak down to children. While kids were entertained, they also were learning valuable life lessons from Mr. Rogers. Appearing on Wednesday’s program are: Deborah Acklin, President & CEO WQED Multimedia; Paul Siefkin-President, Fred Rogers Company; Margaret Whitmer – Director of Video Production and Special Events, Fred Rogers Company & served as producer on Mister Rogers’ Neighborhood; Emily Ruby, Curator, Heinz History Center; Dr. Mariruth Leftwich, director of education, Heinz History Center; and David Newell Mr. McFeely himself. The fourth floor Special Collections Gallery in the Heinz History Center displays the largest collection of original items from the “Mister Rogers’ Neighborhood” television set on public view. 1918 flu pandemic/Most successful presidents? More than 100 people have died from the flu this season in Pennsylvania and it’s considered the worst flu season in 10 years. One-hundred-years-ago, the 1918 flu pandemic killed 50 to 100 million people or about three to five percent of the world’s population. 500 million people were infected. It was one of the worst natural disasters in world history – maybe even worse than the Black Death in the 1300s. What happened a century ago? Dr. Michael Neiberg, Professor of History and Chair of War Studies in the Department of National Security and Strategy, United States Army War College. His published work specializes on the First and Second World Wars in global context. The Wall Street Journal named his Dance of the Furies: Europe and the Outbreak of World War I (Harvard University Press, 2011) one of the five best books ever written about that war. It’s President’s Day – holiday that was derived from George Washington and Abraham Lincoln’s birthdays. Both Washington and Lincoln are considered two of our best and most successful presidents. What makes a president successful? Is there a difference between being popular and being successful? The sad reality is there is a mass shooting in this country every few months. The latest occurred Wednesday at a high school in South Florida where 17 people were killed and just as many wounded. The 19-year-old, who is accused of the shooting, is in custody and has been described as having access to guns and being troubled emotionally. The heartbreak, tears and anger are expressed in every corner of the nation and in most social media posts. Most ask why these shootings keep happening and often point to easy access to guns or mental illness — or maybe a combination. Much of the anger is directed at those who say nothing can be done to stop the shootings or haven’t acted to make an attempt to prevent them. Friday’s Smart Talk guest says no matter what the causes, institutions and places where there are large gatherings of people must prepare for the worst — an active shooter. Kevin Doss is the founder of Level 4 Security, has consulted with the U.S. Department of Homeland Security and Secret Service and has written a book called Active Shooter: Preparing for and Responding to a Growing Threat. Also, February is Heart Health Month. On Friday’s show, we look at a condition that effects about five million Americans. It’s called atrial fibrillation and it results in more than 88 thousand deaths a year. As baby boomers age, those numbers could grow. To discuss Afib with us is Dr. Soraya Samii, a heart rhythm specialist at Penn State Health’s Milton S. Hershey Medical Center. PA’s infrastructure needs — does Trump plan help? When President Trump was campaigning for office, one of his promises was to upgrade and modernize the nation’s infrastructure. The word “crumbling” would usually precede infrastructure. It was an issue that in a country often divided along party and political lines, there was agreement that roads, bridges, dams and the power grid were outdated and in need of repair and modernization. Both sides also thought of infrastructure as a major jobs creator too. Earlier this week, Trump released details of a $1.5 trillion plan that relies heavily on state and private money to get paid for. The American Society of Civil Engineers has been calling for improvements to the nation’s infrastructure for the past two decades. Every few years, the organization issues a report card. Last year, the nation got a D+. The last report for Pennsylvania’s infrastructure was in 2014 and the state was graded with a C-. We discuss the president’s infrastructure plan and Pennsylvania’s infrastructure needs on Thursday’s Smart Talk with Kristina Swallow, President of the American Society of Civil Engineers, Gregory Scott, Chairman of the ASCE’s Pittsburgh Section Government Relations Committee and Robert Lathum, Executive Vice President at Associated Pennsylvania Constructors and with the PA Highway Information Association. Robert Lathum, Executive Vice President at Associated Pennsylvania Constructors and with the PA Highway Information Association, and Kristina Swallow, President of the American Society of Civil Engineers. Governor Tom Wolf has rejected a Republican-drawn congressional map designed to replace the one deemed unconstitutional by the state Supreme Court. The Democrat says the map is still too partisan–while the GOP maintains it follows the court’s order, saying the governor based his decision on that the map wouldn’t favor Democrats. The Pennsylvania Supreme Court, with a Democratic majority, ruled last month that the current Congressional district map, drawn up by the Republican majority in the legislature, was gerrymandered to give Republican candidates an advantage in elections. In the court’s majority opinion, Justice Debra McCloskey Todd said that the state’s congressional district map violates voters’ rights to free and equal elections under the state constitution. The Court gave the legislature until last Friday to come up with a new map and submit it Gov. Wolf, who had until Thursday to send it to the Court. The Supreme Court will decide on their own map if they aren’t satisfied. WITF’s Capitol Bureau Chief Katie Meyer appears on Wednesday’s Smart Talk to break down this complicated issue. We also hear from the good government group Common Cause Pennsylvania which wants maps that are more reflective of the state’s diversity. Executive Director Micah Sims joins us on the program.